Where did you get my name for jury duty and who is considered qualified? Names for all potential jurors are randomly chosen from voter registration lists obtained from the Secretary of State’s office. You are qualified if you are over the age of 18, are a U.S. citizen, and have been residing in the state of Georgia for at least one year. What are the grounds for requesting a permanent excuse and how do I request one? You will receive a response to your inquiry via U.S. Mail. What are the grounds for requesting a temporary excuse and how do I request one? You may request a temporary postponement due to other commitments (vacation, work, health, school, etc.) that may conflict with your summons date. It will be necessary to submit a letter to the jury office with your request at least seven business days prior to when your service is to begin. Please indicate in your letter when you will be able to serve within three months. You can mail, fax, or email your request. You will receive a letter via U.S. Mail (or email if an email address has been provided) regarding the judge's decision and your new service date. How will I know which days to report? You are “on call” for a two week period of time. 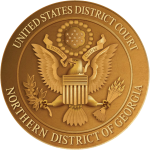 Therefore, every night for two weeks (beginning after 5:00 p.m. on the Friday before your term begins), you should call the automated jury information system at (404) 215-1501. If the message says that you have to report for jury duty, then you would report to the courthouse the following day. If you serve on a case which concludes during your two-week term, you remain “on call” and may serve again. If your case extends beyond the two-week period, you are required to serve for its entire duration (this occurs infrequently). On the first day you report, you will be requested to be at the courthouse at 8:00 a.m. for jury orientation. Depending on how many cases are going that particular day, you could be at the courthouse until 4:30 p.m. - 5:00 p.m. When you are serving on a case, the hours are approximately 9:00 a.m. - 5:00 p.m. (depending on the judge). Jurors should be comfortably dressed. We prefer that you do not come in tank tops, halters, flip-flops, etc. We encourage you to bring a sweater or jacket as the courtrooms can get cold. May I bring a cell phone, laptop, tablet or other electronic device into the courthouse? Cell phones and other electronic devices with cameras will not be allowed beyond the security check points. However, these devices WITHOUT cameras are allowed. May I bring my children with me to jury duty? No. Please do not bring your children to court as there are no facilities for them. How much do you pay for jury duty? Does my employer have to pay me my normal wages if I'm serving on a jury? No, there is no law enforcing employers to pay employees for the time they missed while on jury duty. Often times they will ask that you pay them your attendance fee(s) in order to maintain your salary. However, you should be able to keep your mileage. Can my employer fire me for not being at work due to jury duty? Can I stay overnight the night before I have to report in Atlanta and where should I stay? If you live more than 65 miles from the courthouse in which you are serving, you are entitled to a per diem subsistence rate. (Normally, this applies to Grand Jurors who live in other divisions besides Atlanta). Contact the jury office at (404) 215-1640 for information regarding local hotels. It is very rare that you would need to spend the night. In general, jurors would be notified in advance if they were to be sequestered. What if I am hearing impaired but still want to serve? At their September 1995 meeting, the Judicial Conference of the United States adopted a policy that all federal courts are to provide accommodations to those persons with hearing difficulties. Therefore, the court can provide sign language interpreters. Are there facilities available for nursing mothers? Yes. Contact the jury office for more information.